Well I have been absent for quite some time now living this Spanish life style and let me tell you what, IT IS AMAZING! I highly recommend to anyone to travel to Spain for a study abroad program because just like everyone says, it is a once in a life time opportunity. So for the 1st month in this study abroad program there has been a lot going on. To start, the Spanish language is improving every day. The more you submerse yourself into the Spanish culture and Spanish language while avoiding from only hanging out with your American study abroad friends, the more you will learn. But sometimes it is hard to do. Like me it has be very overwhelming but very productive in learning the Spanish language. Like I said in my post from about a month ago, “It is very hard to learn the language when your teacher only speaks Spanish and just about as mush English as I do Spanish.” Which is very little. But day by day I have been learning a little more Spanish and adding it to my Spanish vocabulary. And the only way to actually learn the Spanish language is to speak it. You can be an expert at Spanish vocabulary and conjugations but if you can’t speak the language you have a lot more to learn. Don’t think that after a month you will be able to fluently speak the Spanish language, because I definitely cannot. I still have to have my roommate translate for me because the Spaniards speak so fast with a thick accent here in the southern part of the country. But we go everywhere together. Two heads are better than one, especially for me because I am only a month into learning the Spanish language and can only communicate on a small scale. Anyway, there are all kinds of things to do here in Spain as either a group or individually. In Sevilla, you have to go see the orchestra concert in the Alcazar which are magnificent gardens located in the center of the city. Right next to the Alcazar is the Cathedral which also happens to be the 3rd largest in the world. If you walk to the top of the tower you can see everything absolutely everything. The Las Setas, which is the big mushroom looking structure, is also another amazing place to visit. During this past month, if you didn’t know, Spain won the Euro Cup and like every American knows, Europeans live and die for futbol a.k.a. soccer! Well things got a little crazy during each continuing round of the Euro Cup as Spain advanced to the Championship game. And the Las Setas was a main attraction for Spanish students to watch the game. Anyway long story short, Spain went absolutely loco when they won and about 250 people piled into one of the famous fountains and took the head off the statue! Moving along, you can see the documents of Christopher Columbus and his exploration and discovery of America. Kayaking or paddle boating in the river is a fun and relaxing activity to do along with going to the water park just on the out skirts of the city. Plaza de Espana is nothing like anything in the world! It was used in the making of the 2nd Stars Wars movie to say the least. And the gardens that lie just to the side of plaza de Espana are like a tropical jungle in the middle of the city. That’s all for now folks. Ill be back in hopefully a week. Ok so the first week is completed! During the first summer session I am currently taking international finance and beginning Spanish 1&2. The international finance class seems to be smooth sailing but however my Spanish class is going to test my abilities. In the very beginning when I had to sign up for my classes that I wanted to take while studying abroad, and one thing that I made sure to do was to choose the Spanish classes that were taught in English. 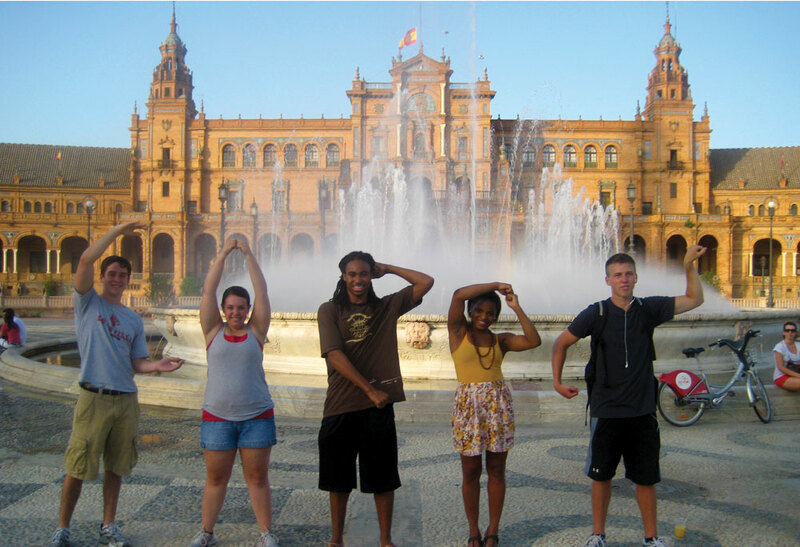 Come to find out that the ISA study abroad program here in Sevilla does not have any Spanish classes taught in English. Now I don’t quite understand how someone who came to Spain with no ability to speak Spanish (me), to learn to speak Spanish is supposed to do so when they don’t know what the teacher is trying to teach?? But oo well. I guess the coordinators just want the students to concentrate harder and pay closer attention to the Spanish culture and piece words together, because frankly it’s a head ache. Overall day by day I learn a little and a little more. By the end of the 2nd summer session the goal is to be able to fully speak Spanish. And besides that being my only complaint, Sevilla is AWESOME and if anyone has the opportunity to do so should then you shouldn’t hesitate. I have been here for 8 nights and I love it!!! Ok, so I have been in Spain for 4 days now and it proves to hold a bright and successful future. Even though I came to Spain with minimum ability to speak, read, or write the Spanish language it has been a blast. Sometimes people say “its not what you know, its who you know.” Well, case closed. When traveling abroad, make sure you have a friend or meet a friend that can become your personal translator and everything will become much easier. I am in Seville, Spain on a back-to-back summer study abroad program and so far I am having the time of my life even though I cannot communicate with the locals or my host family. My roommate Cameron has provided me with more than enough information that I could learn by simply reading out of some English to Spanish dictionary. Overall, my journey in Spain has begun. We have been in Madrid for 2 nights and experienced a taste of the crazy night life during the futbol game for the Spanish President’s cup. It was something that one can simply not describe but can only experience. Along with Madrid, we spent a night in Toledo. Hands down it was one of the most beautiful cities that I have ever been to. Every turn you made or every sight you could see was a Kodak moment. Now, I am in Seville. The real adventure has started and I am soon off to my first class of the program. Beunos noches! !